Earlier Forms of the Story. Character in Shakespeare's play The Merchant of Venice." Shylock is represented as making a wager with Antonio, a merchant of Venice, setting the return of a loan of 3,000 ducats against a pound of flesh to be forfeited by Antonio if he fails to return the money from his own resources by a certain date. Antonio fails to meet his bond, and Shylock, who in the meantime had lost his daughter Jessica by her elopement with a Christian, insists on the forfeit; thereupon Portia, the affianced wife of a friend of Jessica's lover, intervenes in the guise of a lawyer, and declares the bond forfeited because it would be impossible to extract a pound of flesh without drawing blood, which is not mentioned in the contract, and also because the intention of the contract was equivalent to design upon a Venetian citizen's life. This latter crime being, in Venice, punishable by death, the doge remits the punishment only on condition of Shylock becoming a Christian and surrendering half his fortune to Antonio. Shakespeare appears to have taken the plot from a ballad entitled "Ser Gernutus the Jew," or from an English version of Giovanni Floretino's "Il Pecorone," written about 1378. The story appeared in earlier forms than either of these, however, the earliest in which the creditor is a Jew being the English "Cursor Mundi," written about the end of the thirteenth century. In thisversion it is connected with the finding of the cross by Queen Helena, who forgives the Jew for his cruelty on condition of his pointing out the true site of the crucifixion. 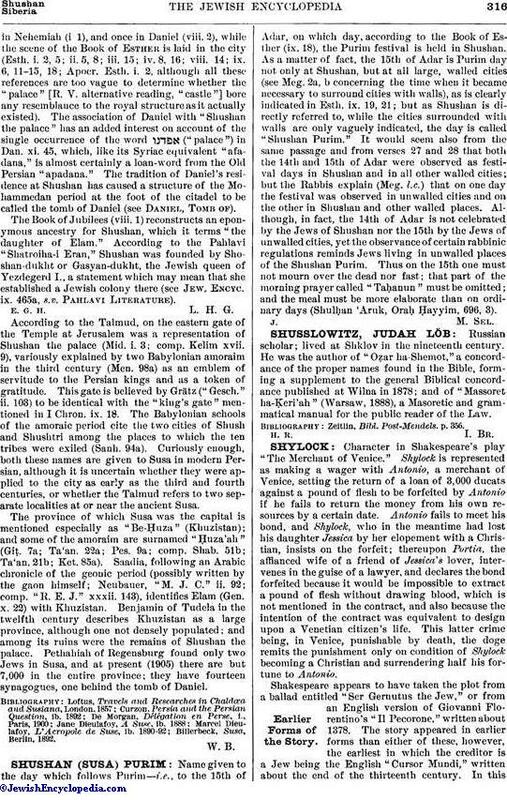 With a non-Jew as principal character the story appears even earlier, namely, in the Sindbad series; here it occurs as the tale of the fourth wise master in the "Seven Wise Masters of Rome," in which the servant of a knight lends the latter 100 marks in order that he may once more try his fortune with his lady-love, on condition that if he does not repay the sum the servant shall receive the right to remove a certain amount of flesh from his master's body. He is foiled by the decision of the king that he must not remove more or less than the specified quantity. In the early English version of the "Gesta Romanorum" the condition by which the forfeit is evaded is that the cruel creditor shall not take a drop of blood. So in the German and Latin versions, though in none of these is the cruel creditor a Jew; and so, too, in similar stories which are told in Persia (F. Godwin, "The Persian Moonshee," p. 8). In one form of the story the cruel creditor is a Christian, Paolo Mari Sechi, and the debtor a Jew, Sansone Geneda, the latter of whom bet a pound of flesh that Drake had not taken the city of Santo Domingo, in Haiti, in 1585. The Jew lost, and, Sechi demanding the forfeit, the matter was put before Sixtus V., who condemned both persons to the galleys, which they could escape only by each paying 2,000 scudi. This story was told by Leti ("Vita de Sixto Quinto," Venice, 1587) eight years later than the first appearance of a play on the subject called "The Jew," and it is generally considered that the story is simply a fable introduced by Leti into the second edition of his work. In Nov., 1879, Frederick Hawkins, in an article in "The Theater," suggested that "The Merchant of Venice" was connected with the state trial of Dr. Rodrigo Lopez; and Sidney Lee, in Feb., 1880, in "The Gentleman's Magazine," pointed out the similarity of the play with the incidents of the plot. The chief enemy of Lopez, like Shylock's, was named Antonio. Henslow recorded that he had brought out in August, three months after the execution of Lopez, a "Venesyon comedey" which is probably identical with "The Merchant of Venice"; and in the autumn of 1584 there were many repetitions of a play called" The Jew," as well as of Marlowe's "Rich Jew of Malta" (see Barabas). It has been conjectured that the public interest taken in the trial induced Shakespeare to revise and rewrite the play referred to by Gosson in 1579 as relating to a cruel and usurious Jew, which was itself derived from a story in the ballad referred to above and in "II Pecorone." Some of the traits in Shylock may be due to the influence of Marlowe, but Shylock was much more human than Barabas, since he was influenced by grief at the action of his daughter as well as at the loss of a prized ring which he had once given to his wife, and was made still more resentful by the business competition of Antonio. In the early traditions of the English stage Shylock was played as a comic character, but Edmund Kean made it a serious one, and he has been followed in this reading by Sir Henry Irving. It has been played with some force in Yiddish by Jacob Adler. 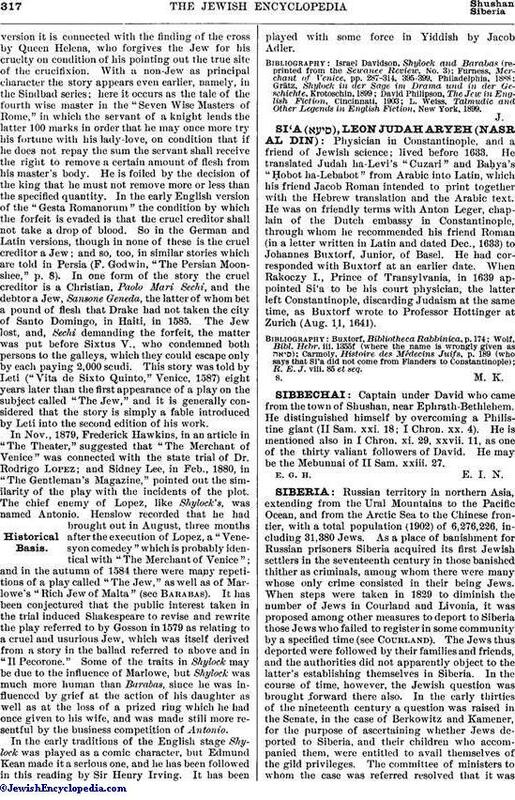 L. Weiss, Talmudic and Other Legends in English Fiction, New York, 1899.